I guess Memphis isn't the only place where school officials are subject to criticism for decisions about closing schools. See the Chicago Tribune article below in which President Barack Obama tells reporters, regarding the weather, "We're going to have to try to apply some flinty Chicago toughness to this town." The article goes on to say that Chicago has not closed their schools since January 1999 due to winter weather. Obama also comments, "...my 7-year-old [Sasha] pointed out that [in Chicago] you'd go outside for recess in weather like this. ... You wouldn't even stay indoors." As of 6:15am Thursday, ALL Memphis-area schools, including DeSoto, Fayette, Tipton, and West Memphis, are OPEN today. Back to work kids! As of tonight, there are no Memphis metro school closings to report for Thursday, January 29. I expect that everything locally will be open on Thursday as streets are in good shape tonight. A complete list of closings can be found on WMC's website via the link to the right. Also, below are some storm reports from across the region as compiled by the Memphis NWS office and MemphisWeather.net. The metro region really dodged the bullet on this storm, considering the video and pictures I have seen from places to our north - from eastern OK through southern MO and northern AR, and into KY, southern IL, and southern IN. Ice buildups in those areas are just tremendous and devastating. Having been through the 1994 ice storm here, I can empathize with their situation. 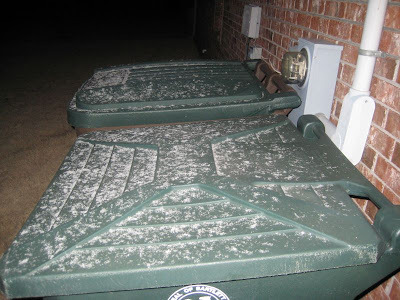 These photos were taken this morning, 1/28/09, of the 3/4" snow we got in Bartlett, TN (northern suburbs of Memphis). The first couple were taken pre-dawn when it was falling. When the sun came up, it was pretty much over. The snow fell within a period of about 1 hour between 5:30-6:30am. The following is the status of closures at metro school districts. Also, Jackson/Madison County and Dyersburg City/Dyer County schools are closed. Visit WMC-TV for a complete list of closings and stay up to date on the forecast, warnings, and other weather information at MemphisWeather.net. Looks like the city and surrounding suburbs survived an ice storm scare by remaining just above freezing at the surface throughout the night. This meant most of what we got was rain, with a little freezing rain in the suburbs. As of 5am, a changeover was occurring, but it went through a brief period of sleet before changing to large wet snowflakes across the metro area. StormView Radar (above at 5:21am) is showing that rapid changeover to snow. This will continue to fall for at least an hour at a pretty good clip, so it's very likely that we could see a half inch to one inch of snow in a short period before ending by 7-8 am. The Ice Storm Warning has been replaced by a Winter Weather Advisory and Shelby County and Memphis City Schools are OPEN today. Please exercise due caution on the roadways this morning, particularly on bridges and overpasses. Stay tuned to MemphisWeather.net for the latest on this winter weather scenario. THE NATIONAL WEATHER SERVICE IN MEMPHIS HAS ISSUED A WINTER WEATHER ADVISORY FOR FREEZING RAIN...SLEET AND SNOW...WHICH IS IN EFFECT UNTIL 9 AM CST THIS MORNING. THE ICE STORM WARNING HAS BEEN CANCELLED. RAIN WILL CHANGE OVER TO A MIXTURE OF FREEZING RAIN...SLEET AND SNOW THIS MORNING ACROSS THE ADVISORY AREA BEFORE ENDING BY MID MORNING. SNOW AND SLEET ACCUMULATIONS ARE EXPECTED TO BE LESS THAN ONE INCH WITH ICE ACCUMULATIONS UP TO ONE TENTH OF AN INCH. A WINTER WEATHER ADVISORY MEANS THAT PERIODS OF SNOW...SLEET...OR FREEZING RAIN WILL CAUSE TRAVEL DIFFICULTIES. BE PREPARED FOR SLIPPERY ROADS AND LIMITED VISIBILITIES...AND USE CAUTION WHILE DRIVING. .THE COMBINATION OF ABUNDANT MOISTURE...A NEARBY LOW PRESSURE SYSTEM...AND COLD AIR AT THE SURFACE WILL PRODUCE A MAJOR ICE STORM NORTH OF THE MEMPHIS METRO AREA TONIGHT. WINTRY PRECIPITATION IS EXPECTED TO SPREAD SOUTHEAST ACROSS THE MEMPHIS METRO LATE TONIGHT INTO WEDNESDAY MORNING. THE NATIONAL WEATHER SERVICE IN MEMPHIS HAS ISSUED AN ICE STORM WARNING...WHICH IS IN EFFECT UNTIL 9 AM CST WEDNESDAY. THE FREEZING RAIN ADVISORY IS NO LONGER IN EFFECT. RAIN WILL SWITCH OVER TO FREEZING RAIN AFTER 10 PM CST TONIGHT. THE FREEZING RAIN WILL THEN SWITCH OVER TO A MIXTURE OF SLEET AND SNOW AFTER 3 AM CST. ICE ACCUMULATIONS 0.25 TO 0.50 INCH CAN BE EXPECTED LATE TONIGHT THROUGH WEDNESDAY MORNING. IN ADDITION...A DUSTING OF SLEET AND SNOW WITH ACCUMULATIONS UP TO ONE INCH IS POSSIBLE. RAIN THIS EVENING WILL SWITCH OVER TO FREEZING RAIN AFTER MIDNIGHT CST TONIGHT. THE PRECIPITATION MAY BRIEFLY MIX WITH SLEET AND SNOW BEFORE ENDING MIDDAY WEDNESDAY. ICE ACCUMULATIONS UP TO ONE QUARTER INCH ARE POSSIBLE LATE TONIGHT INTO WEDNESDAY MORNING. LIGHT ICING WILL BE POSSIBLE ON BRIDGES...OVERPASSES...AND OTHER EXPOSED SURFACES. STAY TUNED TO LOCAL MEDIA OUTLETS, NOAA ALL-HAZARDS RADIO, AND MEMPHISWEATHER.NET FOR THE LATEST ON THIS WINTER WEATHER SCENARIO. With the impending winter storm that includes a forecast of several different precipitation types, I thought it would be an appropriate time to discuss the various precipitation types and how each occurs, with the help of some graphics from USA Today. We'll start with the easy ones. In the wintertime (and any other time for that matter), rain occurs when precipitation falls from clouds through air that is above freezing all the way to the surface, or at least any sub-freezing air is very limited in depth and the temperature of that air is not too cold. Snow is exactly the opposite - precipitation falls through air beneath the cloud layer that is below freezing, or the depth of that freezing layer is sufficient to maintain ice and snow crystals all the way to the ground. As happens many times in the Mid-South, we get some snow when the surface temperature is as high as 36-37 degrees. For this to happen, the depth of that above-freezing layer has to be very shallow, otherwise the snow would melt before reaching the ground and rain would result. See the graphic below. Sleet (or ice pellets) and freezing rain are terms that are typically interchanged, incorrectly I might add, but both can contribute to an "ice storm." They form through different processes, however. In the graphic below, freezing rain results when precipitation falls through a warm layer that melts it, creating rain. Once the rain nears the ground, it encounters a very shallow (sometimes a few hundred feet thick is all) freezing layer and the liquid precipitation freezes on contact with a surface. This produces a glaze of ice that is very dangerous as accumulations can cause downed trees and power lines and very slick road conditions. Sleet, on the other hand, is produced by liquid precipitation that falls through a deeper sub-freezing layer than in the freezing rain scenario, causing re-freezing and producing ice pellets (sleet). Sleet is already frozen before reaching the ground and typically does not accumulate on trees and power lines as readily as freezing rain, unless it is coming down hard enough and in cold enough temperatures at the surface. Hopefully this helps explain the differences between the various precip types. Obviously, an icy condition is more dangerous than snow and snow is definitely more fun to play in during and after the winter storm! Temps are currently (at 10:30am) running in the mid 30s across the metro area with the bulk of the precipitation to our north, though there are some light showers scattered around, mainly north of I-40. Temperatures will remain above freezing through the rest of the day with showers likely, though most of it will be light in the immediate area. As we head into the evening, steadier rain will develop as the precipitation shield to our north starts sliding south along the cold front that approaches. The freezing line, currently well to our north, will slide south and the northern portions of the metro area will likely get to freezing around 9-10pm, while the city itself and southern suburbs reach freezing around 12am/midnight. After the temps hit freezing, precipitation will continue in the form of light to occasionally moderate freezing rain for several hours. By late tonight (probably after 4am), the freezing rain will begin to transition to a sleet-snow mix as colder air moves in and surface temps drop into the upper 20s. Light snow could continue off and on through mid-morning Wednesday. As far as precipitation totals, the potential exists for up to 1/4" of ice, topped by maybe a half inch or so of sleet and/or snow. This will be enough to cause real problems for travel by the morning rush hour, particularly on bridges and overpasses. Sporadic power outages and downed trees could also result. A Freezing Rain Advisory is currently in effect, but could be upgraded to a Winter Storm Warning later on in the day depending on the amount of precipitation expected (1/4" of ice is the threshold for the Winter Storm Warning). MemphisWeather.net will keep you abreast of the conditions throughout this event, including the latest forecast and warnings and StormView Radar, which colorizes precipitation based on the type of precip falling. This blog will carry the latest on school closings and any other updates that are pertinent. Have something to say about the pending winter weather? Leave a comment for me! As of 6:30am on 1/27/09, all Memphis metro school districts are open on Tuesday. Be sure to check in Wednesday morning after 5:30am for potential school closings for Wednesday - I expect it might be a different story! The largest area school districts that are closed today are Dyer County/Dyersburg City, Jackson/Madison County, and Jonesboro public school. 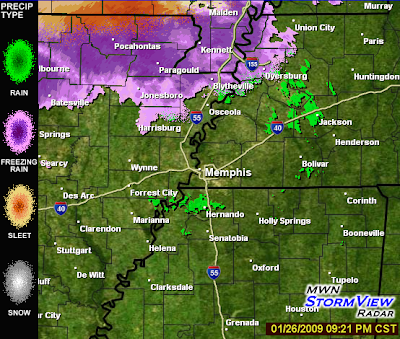 Visit WMC-TV for the latest information and stay up to date with this developing winter storm at MemphisWeather.net. Ice has moved into northeast AR this evening and is beginning to push into northwest TN. MWN StormView Radar shows a large area of freezing rain, with some sleet over southern MO and snow further north. Light rain showers are falling around Jackson and south of Memphis at 9:20pm. I expect more precipitation to break out as the night goes on, but suffice it to say, the worst has just begun over the area covered by the Ice Storm Warning. More than an inch of ice is very possible through Wednesday morning, with the outside chance at 2". No significant changes to my forecast this afternoon. I still expect rain to develop this evening with the possibility of a little light sleet mixed in for the first couple of hours, but then becoming all rain overnight. The only exceptions could be Tipton county and northern Crittenden county, AR, where the temperature could touch the freezing mark overnight and some freezing rain is possible. (North of those locations, an ice storm is a-brewin'!) In Shelby, DeSoto, and Fayette counties, it's currently 37-40 degrees. When precip starts, I expect that to drop a few degrees, but remain above freezing and holding in the 34-37 range overnight. A Freezing Rain Advisory is posted for Shelby, Tipton, Fayette, Crittenden and points north beginning tomorrow at 6am. Tomorrow = rain. Tuesday night, it gets tricky. I'll save more in-depth discussion for later, but it does appear a changeover to freezing rain and/or sleet will occur during the late evening hours, then possibly to all snow by dawn. Amounts of winter precipitation will depend on when that changeover takes place. It could be interesting, especially in northern suburbs... stay tuned. I have links to Mid-South road conditions and school system websites in the right-hand section of this blog. If and when metro school systems close, I'll try and post it here. My thoughts on the potential ice for the Memphis metro area have not changed much since my post last night. I still think that the immediate metro area will likely be missed by the freezing rain tonight, though the National Weather Service has posted a Freezing Rain Advisory for areas from Memphis north, including Shelby, Tipton, and Crittenden counties, starting at 6am Tuesday. I also am pretty confident in the daytime hours Tuesday being just a cold rain. However, this morning my confidence in seeing winter weather on Tuesday night and Wednesday morning is increased as well. See the map below, showing potential for 1/4" accumulations of ice as issued by the NWS. Extreme SW TN is in the moderate probability (40%) area, while locations north of here will be in an all-out ice storm. For more on locations to our north and northwest, check in with JacksonWeather.net and Eddie's blog from Jackson, as well as Ryan's Blog from Jonesboro. I'll continue to keep this blog updated as best I can, including metro school closings as necessary, as well as my Memphis metro forecast on MemphisWeather.net. Rain will move in Monday evening after dinner time with temps hovering near 40 as it starts. I expect the temperature to initially fall, probably into the mid to upper 30s, within an hour or so of precip commencing and some sleet could be mixed in with the rain initially as the atmosphere "saturates," as we in the business say. Once that occurs, temps will level out and the vast majority of the metro area will remain above freezing Monday night with precip falling as rain throughout the night. There is a very slight chance of some freezing rain late, but I think that will stay pretty well to our north. Tuesday will be just plain wet and cold with temperatures not getting above the lower 40s. Tuesday night is when I think things could get interesting in the city. Depending on the timing of colder air moving in on a north wind and precipitation exiting the area behind low pressure, we could see rain change to freezing rain before ending as snow and/or sleet Wednesday morning. The potential exists for up to a 1/4" or so of ice by Wednesday morning with some light snow showers on top of that. I'll update the situation as time draws closer, but I believe the chances are better in the metro area for winter weather on Tuesday night than Monday night. Be sure to check in with the MemphisWeather.net forecast and this blog for updated conditions throughout the week. LOW LEVEL MOISTURE WILL MOVE INTO THE MID-SOUTH BEGINNING MONDAY AND CONTINUING THROUGH WEDNESDAY...AND COMBINE WITH COLD AIR IN PLACE. PRECIPITATION IN THE FORM OF FREEZING RAIN WILL BE POSSIBLE MAINLY ALONG AND NORTH OF INTERSTATE 40 FROM MONDAY NIGHT AND CONTINUING INTO WEDNESDAY MORNING. SOME FREEZING RAIN MAY ALSO BE POSSIBLE LATE MONDAY NIGHT OVER AREAS OF THE MID-SOUTH FROM SOUTH OF INTERSTATE 40 INTO NORTH MISSISSIPPI WITH LITTLE IF ANY ICE ACCUMULATION EXPECTED. THERE IS STILL QUITE A BIT OF UNCERTAINTY AS TO THE TIMING OF THE PRECIPITATION... TEMPERATURES WHEN THE PRECIPITATION OCCURS AND THE AMOUNT OF PRECIPITATION EXPECTED. PERSONS ACROSS THE MID-SOUTH SHOULD STAY TUNED TO THE LATEST INFORMATION FROM THE NATIONAL WEATHER SERVICE REGARDING THIS WINTER WEATHER EVENT. A pretty good winter cold front arrives this evening and signals a change to the weather with temps falling into the 30s overnight and wind chills in the 20s. Some light rain is possible, particularly over north MS, but it should all stay liquid. By morning, if any precip is left around, a bit of sleet or some snowflakes are not out of the question, though confidence is low enough to not include it in the forecast. Temp will remain nearly steady tomorrow in the upper 30s and Saturday night fall back into the 20s. The dry streak continues Sunday and most of Monday with highs in the 40s. Monday night brings some interesting possibilities as precipitation overruns a cold front and moves in from the west. If Monday night temperatures are just right, we could see some light freezing rain. We'll see. The mid-week period looks wet with a stalled out frontal boundary in the area and low pressure systems riding along it, bringing rain chances especially Tuesday and Thursday if models are correct. A note on models in this scenario though: they aren't typically good at timing events this far in advance with the atmosphere setting up the way it is. By the end of next week, we should start to see another warming trend. 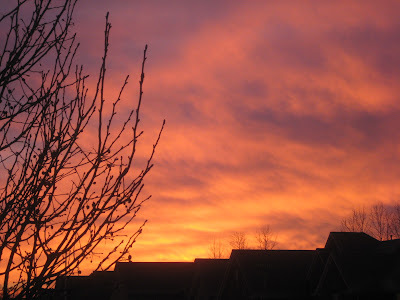 Been meaning to post these for a bit... we've had a series of great sunrises and sunsets the past couple of weeks. Here are a couple of them that I have captured that were particularly outstanding and that my camera did a decent job of capturing! The first is from January 12, 2009 and the second January 14, 2009. Both were taken with a Canon PowerShot SD750 Digital ELPH point and shoot (7.1 megapixel resolution). Yesterday morning's snowfall reminds us just how hard it can be to forecast winter precipitation in this part of the country. While flurries were in the forecast, many areas of the metro region saw much more than flurries, with parts of eastern Shelby County getting up to 1/4-1/2" of the white stuff in moderate to heavy downbursts of snow showers. In Bartlett, I estimate we received about 0.2" of snow, which was pretty to see as it stuck to the roads, roofs, and exposed surfaces. Fortunately we got above freezing and it stopped early enough in the day that it didn't cause too many problems. I did see on my way home yesterday that some county thoroughfares were treated, but it wasn't quick enough for some locations that saw accidents from people not driving as carefully as they should have. Now that that is behind us, a pretty strong high pressure system is shifting off to our east and southerly wind is beginning to blow over the area, bringing the promise of warmer days and plenty of sunshine to end the work week. In fact, the MWN forecast reflects that with mid 40s today and upper 50s to lower 60s the next 2 days! A steady south wind will continue until the next front moves in Friday night. A chance of rain exists with that front, though it shouldn't be a total washout. Cooler air looks to drop back in for the weekend while the extended forecast is still very much in doubt as computer models haven't settled on anything yet. The good news (or bad news I suppose) is that there is no more winter weather in the forecast for the next week - at least not yet. Another quick update to the blog as snow has fallen, at times at a pretty good clip, for a couple of hours this morning beginning around 7:15am. The flakes were huge and were coming down fast enough to start sticking to roads, sidewalks, and the thich grass. On my drive to work, there were many areas that, even though traffic was consistently rolling over it, the snow was coming down fast enough to accumulate under the tires. If I were home I'd provide a better estimate on the amount but word-of-mouth, radar signatures, and local reports tell me there is at least a 1/4" and maybe up to 1/2". The NWS has issued a Winter Weather Advisory calling for the possibility of up to an inch in heavy bursts of snow in some locations. Below is a video I took this morning of the snow falling in Bartlett around 7:30am. This is before it got heavy! Just wanted to make a quick posting to report the dusting of snow we received this morning around 6am and it is now falling again at 7:15am. We've had a 10% chance of flurries several times in the past week and finally got some! Maybe this will be the extent of our snow for this season!? Here are a couple of pics. 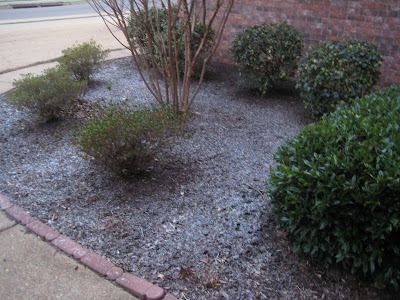 It was not visible in the thick Bermuda, but a coating was found on the trash cans, a little on rooftops and other exposed surfaces, and also on top of the mulch in our flower bed! For those curious as to what the weather will be like in Washington D.C. tomorrow when you tune in for the Inaugural events, the NWS in Baltimore, which is responsible for D.C. as well, indicates a high temperature near freezing with a slight chance of snow (about 20%), mainly during the afternoon hours and amounting to no more than a dusting. The morning low tomorrow will be around 25 and skies will remain mostly cloudy. A north wind of 10-15 mph will not help a whole lot. But it could be worse! See the Presidential Inauguration Weather page to see what the weather has been like at previous inaugurations. It has varied a great deal! Meanwhile, back in The Home of the Blues and the Birthplace of Rock 'n Roll, we will see another day or so of cold weather before things start improving here as well. A morning cold front will be reinforced by another shot of cold air tonight, this one bringing a very slight chance of snow flurries early Tuesday. Highs will remain in the 30s Tuesday before warmer weather arrives for the remainder of the week with highs getting back to the 50s (wasn't Sunday afternoon's 50+ degree temp a nice surprise??). A chance of rain appears on Friday. From official records, Memphis Int'l Airport dropped below freezing on Wednesday night at 11pm and has been below freezing ever since - a streak of 44 consecutive hours so far. That string will end tomorrow morning, probably around 8-9am, getting us to about 57 consecutive hours of sub-freezing temps. At MWN's WXLIVE! weather station in Bartlett, the sub-freezing weather started at 9:30pm Wednesday and will probably end right at 60 hours. Brrr!! In that time, we've had a high of 28 yesterday (25 in Bartlett) and 24 today (21 in Bartlett) and this morning's low was 12, while it dropped to 9.7 in Bartlett. The official low of 12 this morning was the coldest temperature since January 24, 2003 in Memphis - a week short of 6 years ago. We don't see this kind of cold too often! In fact, many schools in Middle TN were closed today due to temps dropping well into the single digits with wind chills below zero. The good news is, the really cold weather will be behind us after tonight. Tomorrow we should see highs back into the 40s (a veritable hot spell) with very gusty southerly wind. A few cold fronts or impulses will pass through over the next several days but we should maintain "near normal" winter type weather for the forseeable future. For more, check out the MWN forecast. Here's a look at 6am CST temperatures across the nation. Chicago is currently at -17! The deep trough is evident extending from the Great Lakes south where temps are the coldest. Based on my current forecast, I expect temperatures to stay below freezing at Memphis Int'l for about 60 consecutive hours, beginning tonight shortly after midnight and continuing through late morning Saturday. Thursday's high will be 27 and Friday will be 29. Thursday night will be the coldest night: 10 at the airport, 5 at the WXLIVE! sensor in Bartlett and places like Arlington, Collierville, Millington, and Olive Branch. This would be the lowest temperature recorded at the airport since 1/24/03 when the mercury also dropped to 10. The last time we recorded single digits was 1/11/97 when the low was 8 (and the high was 20). Record temperatures are well below these levels though, so I don't expect any records to fall. Wind chills will make the cold feel even colder with "feels like" temperatures dropping below zero Thursday night/early Friday and in the single digits late tonight through mid-day Wednesday. At least we're not farther north! Temps across the Midwest and Northern Plains are struggling to get above zero and wind chills are in the -30 to -50 range - in the Continental U.S.! We're not talking about Alaska or Siberia here. Please do take all necessary precautions against the cold weather: dress in layers, make sure pets are protected and warm, watch over the elderly and very young, and wrap pipes if necessary to keep them from freezing. Fortunately we're not going to be dealing with winter precipitation this time around, but don't let that keep you from being prepared. Stay warm and stay safe, and be sure to check in on MemphisWeather.net for the latest updates during this Arctic blast. AN ARCTIC COLD FRONT WILL MOVE ACROSS THE MID SOUTH THIS EVENING AND OVERNIGHT HELPING TO USHER IN A VERY COLD AIRMASS. TEMPERATURES ARE FORECAST TO DROP QUICKLY BEHIND THE FRONT TONIGHT WITH LOW TEMPERATURES DROPPING INTO THE UPPER TEENS IN MEMPHIS SUBURBS TO LOWER 20S ACROSS NORTHERN MISSISSIPPI. BRISK NORTH WINDS WILL COMBINE WITH THE COLD TEMPERATURES TO PRODUCE DANGEROUSLY LOW WIND CHILL VALUES ACROSS THE AREA LATE TONIGHT INTO THURSDAY MORNING. A WIND CHILL ADVISORY HAS BEEN ISSUED FROM MIDNIGHT TONIGHT THROUGH 10 AM CST THURSDAY MORNING FOR PORTIONS OF NORTHEAST ARKANSAS...THE MISSOURI BOOTHEEL...AND NORTHWEST TENNESSEE. COLD TEMPERATURES AND GUSTY WINDS WILL CONTINUE ON THURSDAY WITH WIND CHILL VALUES REMAINING IN THE TEENS AS ACTUAL HIGH TEMPERATURES REMAIN IN THE MID 20S. ARCTIC HIGH PRESSURE WILL SETTLE DIRECTLY OVERHEAD ON THURSDAY NIGHT INTO FRIDAY MORNING. THIS WILL ALLOW FOR TEMPERATURES TO DROP TO THE LOWEST LEVELS SINCE JANUARY 2003. LOW TEMPERATURES WILL FALL TO THE MID SINGLE DIGITS IN THE MEMPHIS SUBURBS TO THE LOWER TEENS IN THE CITY. THESE VERY COLD TEMPERATURES WILL INCREASE THE DANGER OF HYPOTHERMIA AND FROSTBITE TO ANY PERSON OR ANIMALS REMAINING OUTDOORS FOR A PROLONGED PERIOD WITHOUT PROPER CLOTHING AND SHELTER. IN ADDITION...EXPOSED OR UNINSULATED WATER PIPES MAY FREEZE AND BURST IN THESE COLD TEMPERATURES. PLEASE TAKE THE NECESSARY PRECAUTIONS NOW TO PROTECT LIFE AND PROPERTY FROM THE VERY COLD WEATHER EXPECTED THURSDAY NIGHT INTO RIDAY MORNING. UNSEASONABLY COLD TEMPERATURES WILL CONTINUE THROUGH SATURDAY MORNING...WITH SOME AREAS REMAINING BELOW FREEZING THROUGH THIS ENTIRE PERIOD. TEMPERATURES ARE EXPECTED TO WARM ON SATURDAY AS SOUTHERLY WINDS BRING MODERATING TEMPERATURES. PLEASE STAY TUNED TO THE LATEST FORECAST AND PREPARE NOW FOR THE VERY COLD WEATHER. So we didn't get any flurries this morning, but part 1 of the Arctic cold has definitely arrived. Temps have fallen since the cold front moved through around 4am this morning and are currently sitting in the mid 30s. I expect the temperatures to stay put between 33-37 today with clouds departing by early afternoon. Wind will remain gusty out of the north through most of the day, making it feel even colder. Late this afternoon, wind will settle down then switch back to the south during the evening hours before increasing again late tonight. Tomorrow will provide a short reprieve from the cold with highs in the upper 40s and a gusty southerly wind ahead of Arctic blast part 2. The much-advertised front will arrive late Wednesday afternoon or early evening and it will all be downhill from there. Wind will be gusty from the north and temps will plummet overnight Wednesday with a low near 20 in the city. Wind chill readings will be in the single digits. Thursday will be the coldest day so far this winter with temps remaining in the 20s all day and a blustery north wind that will keep wind chills in the lower to mid teens throughout the day. Thursday night will be the coldest night. I am forecasting a low of 12-14 at the airport with many locations possibly seeing single digit temperatures early Friday morning. Friday will be only slightly warmer during the afternoon with a high near freezing. The weekend looks cool but tolerable with highs in the 40s continuing into early next week. A weak system moving through this weekend could provide for some sprinkles or flurries Saturday night or Sunday but the timing and strength of this system are still difficult to determine. Like the Memphis Tiger basketball team's nationally-ranked defense, Arctic cold is poised to pounce on the Mid-South later this week. We all know it's coming, but how fierce will it be? This could be the coldest air of the season, and will rank right up (or down) there with Dec. 22 when the high was just 30 and the low was 14. When will it be here? Well, a preview will arrive on Monday night as a strong front moves through with only a slight chance of rain (or snow) overnight Monday into early Tuesday, but with temps that stay in the 30s Tuesday. A brief warm-up will greet us Wednesday before the flood gates (of cold air not rain) open up Thursday. Many locations could stay below freezing all day Thursday with lows Friday morning dropping into the teens area-wide. The warm-up will be a little slower than after the early week cold front, with highs only in the lower to mid 40s through next weekend. A few flurries are possible during this time frame, but any impulses that would produce precipitation are hard to pinpoint right now. Depending on how long the cold air stays around, a storm system next weekend could produce some wintry precipitation. Stay tuned to the MemphisWeather.net forecast! Today's cold front passed WXLIVE! 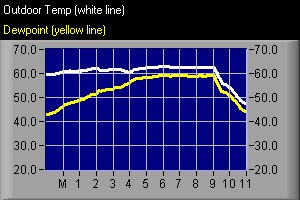 in Bartlett at 9:00am with a wind shift and quick drop in temperatures and dewpoints. See the graphs below and notice the change at 9am. Temperatures have dropped from 62.5 at 9am to 45 at 11:30am. Expect a continued decline, though much slower, in temperatures the rest of the day. Tonight's low will be near freezing. Most of the rain is done, though drizzle and mist could continue for a good part of the day. The frontal position was also very obvious in the temperature map of the Lower Mississippi Valley taken at 6am. See the image below showing temps in the lower 60s in the MS Delta and near freezing as close as northwest AR. According to a study and subsequent article by CareerCast.com and re-printed by the Wall Street Journal among others, Meteorologists have the 15th best job among a list of 200! Factor weighed include Stress, Work Environment, Physical Demands, Income and Outlook. See the full article and rankings here. I know there are several fellow Mets out there that read this blog, so what do you all think? I guess the editors of this article don't know the terrible working conditions, high stress load, low pay, and limited career growth that really exists - but at least I don't have to lift anything heavier than a pencil or donut during my workday! ;-) In all honesty, I love my job and the daily challenges it brings and wouldn't trade it, even if they do take away the donuts! My hope is that that is reflected in my work on this blog and my website, MWN. I'll post more on it later this weekend, but the Arctic is fixin' to pay us a visit! Come next Wednesday and Thursday, you won't know whether you're in Memphis or Fargo, except maybe that there won't be two feet of snow on the ground. For an in-depth read on the extent of the Arctic blast, check out my good friend Eddie's excellent post. Right now, I am calling for highs in the 30s in the big city for the middle of next week - that could easily be adjusted downward by early next week. Only small chances for light snow it appears though! I'm as much a fan of irony as the next guy, so this made me laugh. MSNBC report Mike Sidel is reporting on (or rather in) winter weather and slips and falls on the ice and snow. I'm still waiting for a reporter in a hurricane to get taken out by flying debris... Let me know what you think. Warmer (relatively speaking) air has overcome the metro region and the threat of any ice has ended. Intermittent rain will continue today, tapering this evening, with another brief shot late tonight or towards morning as an upper-level trough moves through. We'll finally see some sun breaking out between the clouds on Wednesday, with more sun Thursday and Friday as we sit between systems. Temperatures will also be much more pleasant for the latter half of the week. The next cold front makes an appearance Friday night with a chance of showers, then cooler temps arrive for the weekend. We'll be watching the forecast closely for early next week as another overrunning scenario sets up and cold air may be in place. Confidence right now in the Monday-Tuesday forecast is very low. The NWS has dropped the Winter Weather Advisory for Shelby and Fayette counties in the metro area, while continuing it for Crittenden and Tipton counties until 3am as temperatures have remained at 33 or higher and will very slowly climb overnight. No further icing is expected for the city or its immediate northern or eastern suburbs overnight. Ice glazing on trees, power lines, etc. will slowly melt overnight as well. 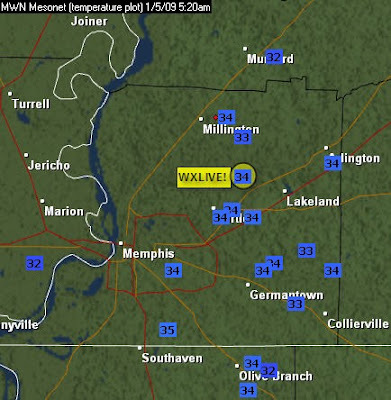 In fact, the MemphisWeather.net WXLIVE! 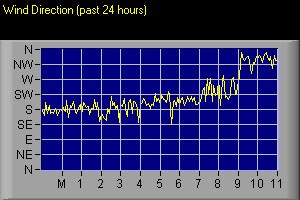 anemometer (that measures wind speed and direction) slowly came back to life between 5:00pm and 8:30pm after being frozen up since shortly after 11am this morning! Further north and west, in northeast AR and northwest TN, things are a little more dicey and Ice Storm Warnings remain in place overnight. An additional 1/4"-1/2" of ice is possible in these locations. Be extremely cautious if you are driving I-55 northbound towards Sikeston or I-40 westbound towards Little Rock tonight or Tuesday morning. The NWS has extended the Winter Weather Advisory for Sheby, Tipton, Fayette, and Crittenden counties in the metro area until 3am Tuesday. Temperatures will continue to hover between 31-33 degrees through midnight before slowly rising as slightly warmer air from north MS starts to move north. See the text of the advisory from the NWS below and please take caution, particularly in northern and western suburbs of the city, if you must be out tonight. 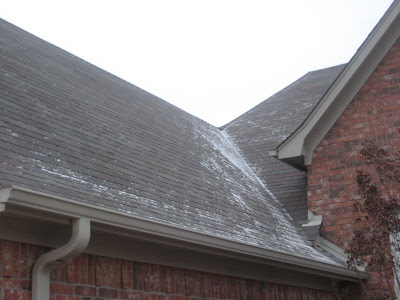 Exposed surfaces, bridges, and overpasses will be most susceptible to freezing conditions. THE NATIONAL WEATHER SERVICE IN MEMPHIS HAS ISSUED A WINTER WEATHER ADVISORY FOR LIGHT FREEZING ...WHICH IS IN EFFECT UNTIL 3 AM CST TUESDAY. AFTER 3 AM... PRECIPITATION SHOULD BECOME PREDOMINATELY LIQUID. A WINTER WEATHER ADVISORY FOR SLEET AND FREEZING RAIN MEANS PERIODS OF SLEET AND FREEZING RAIN ARE IMMINENT OR OCCURRING. DRIVING MAY BECOME EXTREMELY DANGEROUS...SO BE PREPARED TO USE CAUTION WHEN TRAVELING. The NWS has issued a Winter Weather Advisory for all of west TN and northeast AR, valid until 4pm. MWN StormView Radar shows an area of precipitation moving in from the west at 9:30am, which is falling into the surface-based cold layer. Currently, it is 35 degrees at the airport and above freezing all across the city and its suburbs. However, temperatures are expected to initially drop as the precipitation moves in, possibly to very near 32 degrees, especially in northern suburbs. This is the reason for the Winter Weather Advisory. A thin glaze of ice may be deposited on overpasses, flyovers, and bridges, as well as exposed surfaces this morning. Temperatures should slowly rise later this afternoon and all precipitation after about 4pm should fall as rain. Further updates will be issued as conditions warrant. 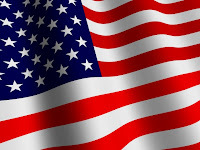 Stay with MemphisWeather.net for the latest information. As relayed through this blog late last evening from the NWS, all eyes are on the potential for light freezing rain during the day today. Here's an update. 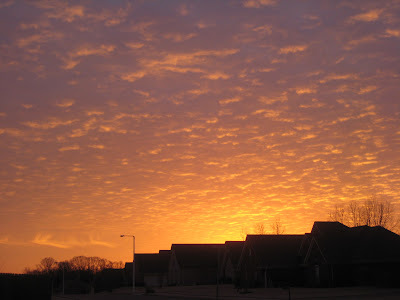 For more rural areas of west TN, as well as the Jackson area, I'll refer you to an excellent post this morning on JacksonWeather.net's blog. In the metro area, temperatures hover around 33-35 degrees at 5am (see temp map below) with a light northeasterly breeze. The dewpoint (a measure of the moisture in the air at the surface) sits in the mid 20s. MWN StormView Radar shows no precip as of now. The cold air at the surface is very shallow, with temperatures increasing with height above the first couple thousand feet. This temperature profile, and the dewpoint, are keys to today's weather. I expect precipitation to start to materialize after lunchtime, with increasing intensity as we head towards rush hour and into the evening. With abundant cloud cover, low dewpoints, and a northeast wind, the surface temp will struggle to rise much at all today, and when precip starts, it may actually fall a couple of degrees initially (a process Meteorologists call wetbulbing, as the air saturates the initially drier air near the surface). As rain begins to fall heavier, I believe the surface temp will stop falling and may actually begin a slow climb overnight. All of this means that initial light rain that falls could freeze on contact, especially on exposed surfaces, bridges, and overpasses, depending on how far the temperatures falls in those first few hours that the precip falls. The most critical timeframe, I think, in the metro area will be from noon until about 4pm, and particularly in the northern suburbs of Arlington, Millington, Lakeland, and points north. By rush hour, I expect that most everyone will be above freezing, though a few slippery spots may still exist on overpasses of 385, I-55 north of Memphis, and possibly I-40 east of Memphis. The next thing to watch will be the possibility of flooding as the ground is still fairly soaked and we may see as much as 2" of rain by Tuesday evening when it tapers off. In fact, Flood Watches are in effect for areas south of the city. I'll keep an eye on all of it all day, so stay tuned to this blog and the forecast over at MemphisWeather.net, as well as commercial outlets and NOAA All-Hazards Radio, for complete coverage. A COLD AIRMASS CONTINUES TO FILTER INTO THE MID-SOUTH THIS EVENING BEHIND A COLD FRONT THAT EXTENDS ACROSS NORTH CENTRAL MISSISSIPPI. TEMPERATURES WILL CONTINUE TO FALL TO NEAR OR JUST BELOW FREEZING BY EARLY MONDAY MORNING ACROSS AREAS ALONG AND NORTH OF INTERSTATE 40. A SERIES OF WEAK UPPER LEVEL DISTURBANCES WILL MOVE ACROSS THE AREA ON MONDAY AND MONDAY NIGHT. THIS WILL ALLOW LIGHT PRECIPITATION TO REDEVELOP ACROSS MUCH OF THE MID-SOUTH BY MID-MORNING MONDAY...CONTINUING INTO MONDAY NIGHT. TEMPERATURES MAY REMAIN NEAR THE FREEZING MARK THROUGH AT LEAST EARLY MONDAY AFTERNOON ALONG THE INTERSTATE 40 CORRIDOR...INCLUDING THE CITIES OF MEMPHIS AND JACKSON. THIS MAY RESULT IN A PERIOD OF LIGHT FREEZING RAIN WHICH COULD RESULT IN ICY SPOTS ON BRIDGES AND OVERPASSES...RESULTING IN HAZARDOUS TRAVEL. ALTHOUGH THE POTENTIAL FOR LIGHT FREEZING RAIN AND ICY TRAVEL APPEARS TO BE INCREASING...THERE STILL REMAINS SOME UNCERTAINTY WITH RESPECT HOW FAR SOUTH FREEZING TEMPERATURES WILL REACH. PLEASE REMAIN UP TO DATE ON THE LATEST FORECAST AND THE POTENTIAL FOR LIGHT ICING. FREEZING RAIN ADVISORIES MAY BECOME NECESSARY FOR PORTIONS OF THE MID SOUTH ON MONDAY AND MONDAY NIGHT.